Lately, K-pop has not stopped delivering for a second. And, as long as it stays this good, I’m going to continue this brand new KultScene series as long as I can. Missing out on great album tracks like this would be a total shame so if I can do anything to help, I’m there. I’m opening up the list to boys now too, though, as they in particular dominated the past month. Songs featured in this month’s Best K-Pop B-Sides list touch on graceful electronica, soaring disco, dirty rap, Latin guitars, and melancholic hip-pop. I can’t remember how I came across this track as I have never listened or even wanted to listen to UNiQ in the past, but I sure am glad that I did. Listen to Me, from the Korean/Chinese boy groups latest album EOEO, is one of a few truly great songs to come from boy groups last month. Listen to Me plays like the fidgety dubstep K-pop track we have come to expect from so many rookies recently. It’s filled with elaborate wubs and whizzes, and builds to an expected big drop. But right at that moment, the song turns itself on its head. Instead of descending, it soars to an ecstatic beautiful chorus of sparkling disco and dance pop. This lavish chorus contrasts perfectly against the electro beats. The chorus raises the rest of the song to another level and shows a level of craft beyond the rookie UNiQ supposedly is. What could have been another entry into the endless wasteland of forgotten brostep becomes something new to latch onto. I’m dubbing April the month of “Boy Group Dubstep Tracks That Turned Out Better Than Expected.” You can use that catchy title yourself. BTS returned on the last day of the month with the brilliant I Need U, which came from an equally brilliant album, In The Mood For Love. Apart from I Need You the standout is probably the slightly more subdued Hold Me Tight. At four and a half minutes long Hold Me Tight takes its time to fully reveal itself. When it does, we get is a melancholic piece of hip-pop showing off the qualities of BTS that we already know but in new ways. A twinkly piano melody slowly builds into soft beeping synths at the beginning, sounding more like a cute love song than what we actually get. To counter these tones, Rap Monster enters first with a more melodic rap than we are used to before powering in with his trademark angry sound. This rap sets out not only the musical range of the song but the lyrical too. One half is melancholic and lonely, the other is angry while still lonely; Rap Monster turns this into a beautiful yet bitter lament. The album as a whole represents maturation for BTS. The group is stepping out the shadow of being the next B.A.P, another group with fierce hip-hop elements, and setting out its own style and sound. Dal Shabet has had a hard time trying to crack the big time. The group has released several songs that have attempted to cause controversy along with songs that are simply amazing. None of them however, have done enough to gain the girl group much success. Dal Shabet better stay around though, so we can still get absolute gems like Obsessed. Joker has been mostly overlooked for being trashy and uninteresting as a typical idol song, but if they had led with Obsessed Dal Shabet could have been elegant alt-dols. The song is a burst of electronica that belongs alongside the other 90s throwbacks that K-pop has given us recently. The melty synths that pop in and out match exquisitely with the factory-like snares. The song has a polished purity to it that many K-pop songs may be missing. The vocals are also a pure delight. Subin’s wails at the chorus are a particular pleasure to the ears. Like BTS, Block B have really been coming into their own lately. Her was one of the best songs of last year and subunit Bastarz’s new single Zero For Conduct is a smash. That wasn’t the only good thing to come out of the new subunit though, as the album has some more interesting things within. For sheer weirdness Sue Me is the other highlight. Like Zero For Conduct, it’s a diss track at anyone who might get in the way of Block B (or Zico really). This one is dominated by P.O as he leads this track spinning vitriolic rhymes about how great he is. While this is a fairly standard hip-hop element, it’s what’s next that makes the song weird. The chorus with slow chants of “sue me” and auto-tuned vocals sound like a dub-reggae track. It is jarring yet makes more sense as the song goes on. This is a dirty track; its almost aware of the arrogance P.O and featured rapper Incredible are spitting. It also works as a song that understands hip-hop more than most idol songs do. Dub was a huge inspiration to the first rappers of the Bronx and putting in a song like this acknowledges hip-hop’s history as best you could. It gives weight to Zico (who helped write and produce) and P.O’s desire to be recognized as more than idols. EXID’s excellent follow up to Up And Down, Ah Yeah was a confirmation that the girl group could build on what it did before and also comment on it. There was an EXID before Up And Down however, and it was just as good. The group’s best song, in fact, Every Night is from 2012 and it is with this song where we pick up on them now. Just as Ah Yeah was a follow up to Up and Down, Thrilling is a kind of follow up to Every Night. The Latin guitars are immediately recognizable, the opening riffs themselves sound like they were lifted straight from the earlier song. It also uses beeping electronics alongside these to create a nice contrast. Thrilling is not a mere rerun in the same way that Ah Yeah is not either. It doesn’t go for a much bigger sound but changes elements enough to make it its own. The chorus in particular is striking for its commitment to the Latin sounds. Solji’s passionate voice fits so perfectly with the guitars and the kind of notes she has to hit here. I can’t say enough how much I like Soji’s voice, I hope she can get her due attention soon. She lifts the stripped back production to extravagant heights. What was your favorite B-side of April? Did we miss your favorite? Share your thoughts in the comment section below and be sure to subscribe to the site and follow us on Facebook, Twitter, Instagram, and Tumblr to keep up with all of our posts. BTS is, without a doubt, a very talented group. The majority, if not all, of the members have a hand in the writing of their songs, and some of them have even ventured into producing music. But before these seven talented guys became a huge success, they were writing and recording demos. Luckily for us, some of those have made it onto their SoundCloud. 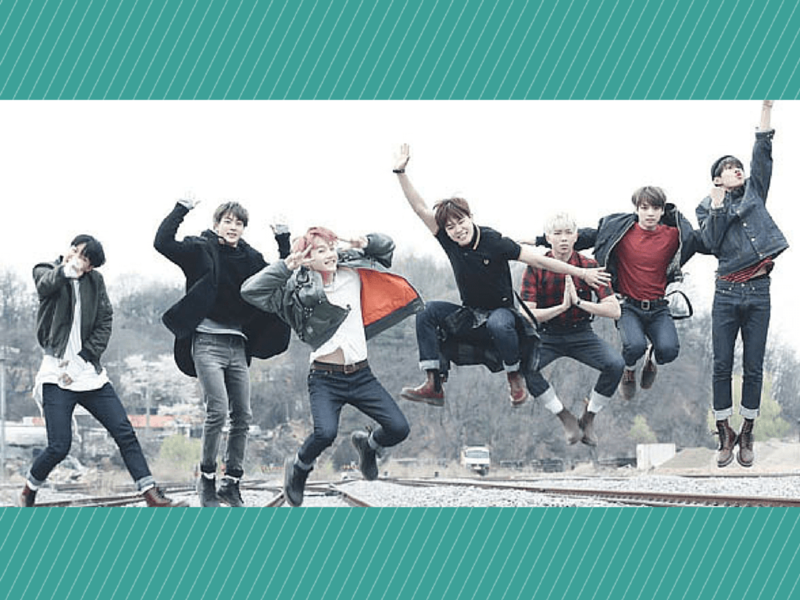 With a total of 21 tracks on the site, BTS gives fans a little bit of everything. Singing, rapping, singing and rapping, great beats, and catchy tunes. The following highlights a few tracks from BTS’ SoundCloud that you should listen to. 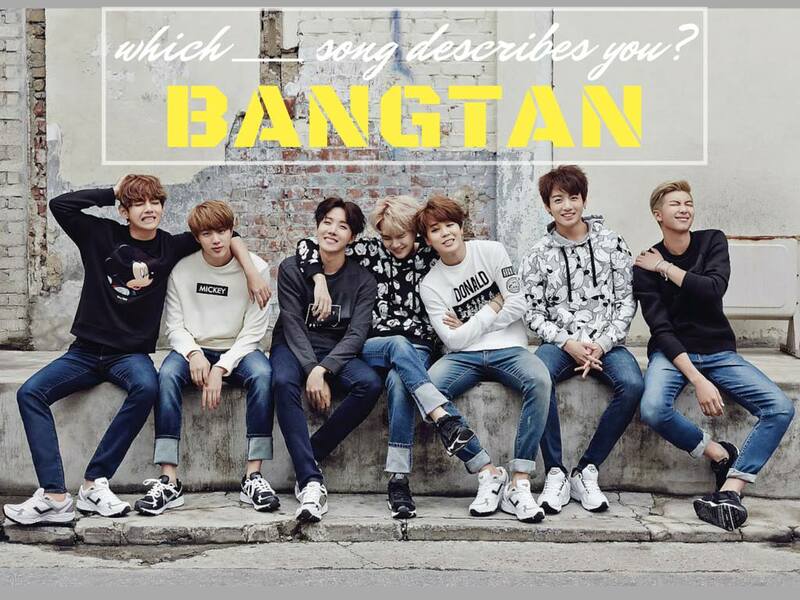 Beautiful displays the rapping and singing skills that BTS as a group holds. The sound and music is light and enticing. The boys’ younger, more raw vocals truly showcase the base for their talent. The rapping isn’t too harsh, which parallels the soft vocals throughout the song. Born Singer is another of the singing/rapping tracks on BTS’ SoundCloud. Similar to Beautiful, Born Singer, again, highlights the groups’ individual skills and skills as a cohesive group. The rapping is much more intense and hard hitting, whereas the singing is softer and more delicate. Also on KultScene: Has Wa$$Up Found Its Musical Niche? The next song only showcases Rap Monster’s skills. But instead of highlighting his impressive rapping, Monterlude introduces fans to Rap Monster the vocalist. Now, he does not have the strongest vocals in the group, but the way he delivers the lyrics to Monterlude perfectly embodies the emotion of the song. We have to give Suga some love, his solo rap track All I Do Is Win displays his quick rap with an attractive beat. The song may be short but it perfectly embodies Suga as a rapper. He is hard hitting, fierce, and confident in his delivery. Similar to Suga’s solo is one of Rap Monster’s many solos on their SoundCloud, Rap Monster. The song personifies the young rapper. The beat is the first thing we hear and it immediately grabs you for the entirety of the song. Rap Monster’s delivery, at first, is steady and crisp. As the short solo continues, he quickly increases his words per beat for a portion of the song, which perfectly shows off his impressive rap skills. Rap Monster, Suga, and Jin are the perfect combo to pull off this style of song. Jin’s soft vocals perfectly match the high pitched piano, while Rap Monster and Suga’s deep and raspy voices beautifully create contrast and add another layer to the already good song. The beginning of Too Much is something completely different than what you might expect from someone who calls himself ‘Rap Monster.’ Sampling Drake’s song by the same name, the introduction immediately grabs you with the hollow piano and Rap Monster’s raw vocals at the chorus. He goes between his impressive singing and flawless rapping throughout the song. 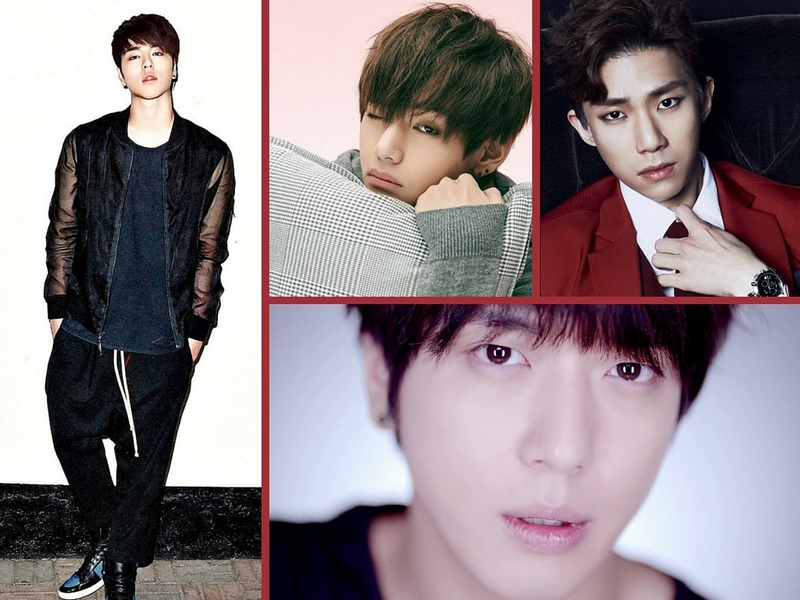 Too Much is a beautiful song that impressively showcases the leader’s multiple talents. What are your favorite tracks from BTS’ SoundCloud? Share your thoughts in the comment section below and be sure to subscribe to the site and follow us on Facebook, Twitter, Instagram, and Tumblr to keep up with all of our posts. October 31 is a day for costumes and candy, but sometimes people are too busy to put together extraordinary costumes that need tons of planning. If you’re one of those people and you’re looking for some last minute inspiration, or heading to an exclusive K-Pop themed Halloween party, then you’ll need a great costume that’s simple, and that you can make from what you have in your closet. An oldie but a goodie, Gee. For many people, Girls’ Generation’s Gee was the song of 2009, and is still one of the most iconic songs in K-Pop. But the outfits that the nine members of Girls’ wear are so simple, just about every girl has something to work with inside her own closet. You have two options here- You can go the minimal look that Girls’ Generation dances in by wearing a white long sleeved shirt with a solid color pair of shorts and white shoes. Blow dry your hair straight, or throw in some soft waves. Or, you can go the skinny-jeans look. All you need is a graphic t-shirt, preferably with cap sleeves or no sleeves at all, and a a colored pair of skinny jeans. Throw on one iconic accessory, – a long necklace, a costume pilot’s hat, a fedora, a sequined hoodie etc- add a pair of killer heels and you’re all done. Crayon Pop’s helmet look from Bar Bar Bar. For this one, you need a polo shirt, a short skirt, a pair of leggings that are the same color of your shoes and preferably the skirt (try all black if white is not an option,) and throw on a bike helmet. Add some white gloves from your winter closet, or else run to a local pharmacy and buy a pack of medical gloves. Put multiple ponytails into pigtails to get Soyou’s look. Finishing touch? Put your name on your chest and on your back with some name tag labels or use a safety-pin to clip paper to your shirt. Costume recognizability to non K-Pop fans- 3/5, but people may theink you’re Yony and Zony, the two twins who appeared on Ellen rather than Crayon Pop. While Hood By Air clothing that BTS wears may be a bit hard to get last-minute, but you can definitely pull off the look. Anything black and white that you own, layered with gold jewelry and/or bandanas, the more athletic-looking the better. If you have a varsity jacket or athletic jersey, you just owned this outfit. For your feet, black-and-white tube socks pulled up rather than rolled down with black and white sneakers complete the outfit. Surround your eyes with thick black eyeliner, and, if you want, add a baseball cap or bandana. If you’re trying to be Rap Monster, sunglasses are a must, but if you don’t have his intense-visor type, just wear a black headband over your eyes. Costume ease level – 4/5, it sounds easy but putting the outfit together and layering properly can be difficult. Costume recognizability to non K-Pop fans- 1/5, people may think you’re just trying to be a random rapper, which is also cool. Again, two options here. Take a solid color dress, or tight shirt and shorts/jeans combination in the same color, and put large graphic stickers on them. Ideally, iron on stamps would be great, but then you’d ruin your clothes. Add white sneakers, cream eyeshadow with coral lipstick, a faux pearl necklace, bracelets, and big earrings– you’re ready to imitate the copycats. If you want to really rock it, match your nails to the color of your outfit. Alternatively, put on a short jean skirt and a horizontal red-and-white striped shirt for the look from the end of the video. If you have overalls or a jean romper, that’s even better. Add a striped bow headband, and you’re all set. Don’t have one? Use paper and draw stripes, then attach it to your headband. Not ideal, but it works! Don’t forget the dark red lipstick! Costume recognizability to non K-Pop fans- 2/5, people might think you’re Where’s Waldo. 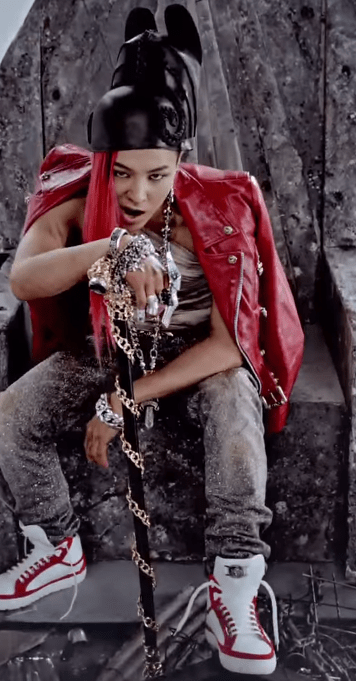 Fantastic Baby has an intense concept, and you’re going to have to tone it down a bit. The first thing about G-Dragon’s outfit is the hair, which may seem like a problem, but it can actually be pretty easy. You may have to run to a drugstore for some hair extensions or, if you have long hair, red hair spray. You may need both, let’s be honest. Unless you have a black-and-white pinstriped suit, you’re not going to be able to do G-Dragon’s most iconic outfit. But there’s another one that will definitely do! Pull on a black beanie or winter hat, with a red jacket, a white/beige t-shirt, gray pants, and gym shoes. Red and white shoes would be best, but hey, there’s not much you can do last minute so just go with it! As for accessories, bedazzle (or put gold stickers/tape) on an umbrella, and put on some intense bracelets and necklaces.Add a smoky eye, with eyeliner on the lower lid, and the rest of the face pretty clean of makeup, and you’re going to be a great GD! Costume ease level – 5/5, other than the umbrella, the costume’s pretty simple. Are you dressing up as K-Pop stars for Halloween? Send us pictures! Leave your thoughts in the comment section below and be sure to subscribe to the site and follow us on Facebook, Twitter, Instagram, Tumblr, and Bloglovin’ so you can keep up with all our posts. Idol hip hop group BTS (Bangtan Boys) held a small showcase at Troubador in Los Angeles, CA on July 14th this year, titled BTS Show and Prove, where they treated fans to their newly attained skills and well-known songs. For the past couple of weeks, Jin, Suga, J-Hope, Rap Monster, V, Jimin, and Jungkook have called L.A. their home, as they’ve been busy filming a reality show and getting mentored on different hip hop skills for their upcoming new album. The sudden news of a free BTS concert came as a unexpected surprise for A.R.M.Y., who had less than two days to hustle in order to attend this (most likely) once in a lifetime, intimate performance by the boys. The catch to the event? Only the first 200 fans to arrive would get in, even if the venue had a 400 people capacity. Despite the venue’s strict rule of prohibiting people from lining up hours or even days before a given event, fans bypassed the restriction and camped out as early as 8 p.m. the prior day. As more and more fans arrived, some people passed a notebook in order for everyone to write down their name in order. Luckily for these fans, the production respected the list and granted them little blue tickets, along with a number brand on their arms. Across the street from the Troubador, the line of hopeful A.R.M.Y members in the park reached almost 400, and most people were told to leave, given that their chances for getting in were extremely low. The production also told ticket holders to leave and come back at 5:30, 30 minutes prior to the start of the show. But even then, some of the unlucky fans remained put in the park. Hope was at-large. Even if having a ticket was the main reason fans remained in the park, they did get some perks! Fans rushed to the Troubador’s back alley when they spotted a white van arriving carrying three BTS members, including Jimin, who was the only one who waved at everyone. Moreover, the production went to the park and began interviewing recording fans for what we presumed was their reality show. A.R.M.Y. chanted, “BTS saranghaeyo,” and the opening lines for No More Dream. At 5 o’clock, ticket holders began to line up, while the rest of the fans remained hopeful at the park. When the first people were let into the venue an hour and a half later, everyone else was, once again, told to leave. But fans were relentless. They stayed at the front of the Troubador and even got to see from a window when the guys started the show with We Are Bulletproof Pt. 2, which had to be redone because of audio problems despite the boys’ going full-on acapella. The outside fans tapped the window and chanted “BTS, BTS,” however limited the view was. It seemed like a lost cause, but then someone, some blessed someone, took pity on the 50 or so without a ticket and eventually let them in. All those uncertain waiting hours had not been in vain. BTS Show & Prove was, as the name implies, for the group to show all the skills they learned with their mentors in the city of Angels up and to prove how good they became due to the mentorships. The venue was small enough for there to be no bad spot; you had a good view of the stage wherever you stood. Fans swarmed the pit to get as close to the idols while the balcony was reserved for film crew, mentors, and guests. BTS dedicated the first part of the show to display their newly developed talents. Jin and J-Hope beatboxed along with their mentor, who also performed and later said that both of them were some of his best students ever, given their hard work and talent. Also, Jungkook, Jimin, and J-Hope had a dance battle with other performers, where they displayed new urban moves. They also sang a rendition of Oh Happy Day from the film, Sister Act 2. After this portion, BTS answered a few fan questions from a board, which fans had previously given to the production. Among the highlights, Jimin sang, to everyone’s delight, a cover of Taeyang’s Eyes, Nose, Lips while Jungkook performed Justin Beiber’s Boyfriend. Suga, for his part, had to do aegyo, while Rap Monster did krump. As for dancing, fans asked J-Hope to do a girl group dance of his choice, which were 24 Hours by Sunmi and Beyonce’s Single Ladies. Moreover, Jin did a little cute dance, much to the members’ funny discomfort. Then the “appetizer,” as Rap Monster called it, of the show ended and it was time for “the main dish:” more of BTS’ own songs. These included I Like It, Boy in Luv, Rise of Bangtan, and a No More Dream encore. Fans happily sang along to all the songs at the top of their lungs, which sometimes made it difficult to hear BTS themselves. The show was expected to last about an hour, but ended up running for almost two. At the end of the show, the guys said their goodbyes and pinky promised to come back next year with their own show, even though they’re part of the KCON roster this year. BTS was successful in proving that their time in L.A. had been spent well, for they put on a great show by displaying all their new skills. Their performances were high energy from start to finish; everyone — even the choreographers and other mentors — were chanting, jamming, and dancing along to their songs. The members, despite sweating because of the hot venue, seemed rested (compared to other idols who don’t put on the best shows out of tiredness from their schedules) and excited to perform. There wasn’t a moment when they didn’t have ear-to-ear grins plastered on their faces, reciprocating the audience’s grateful smiles. At the end of the day, no one could think of any ticket troubles, because the show was well-worth it. Did you go to BTS Show And Prove? Share your favorite moments with us! 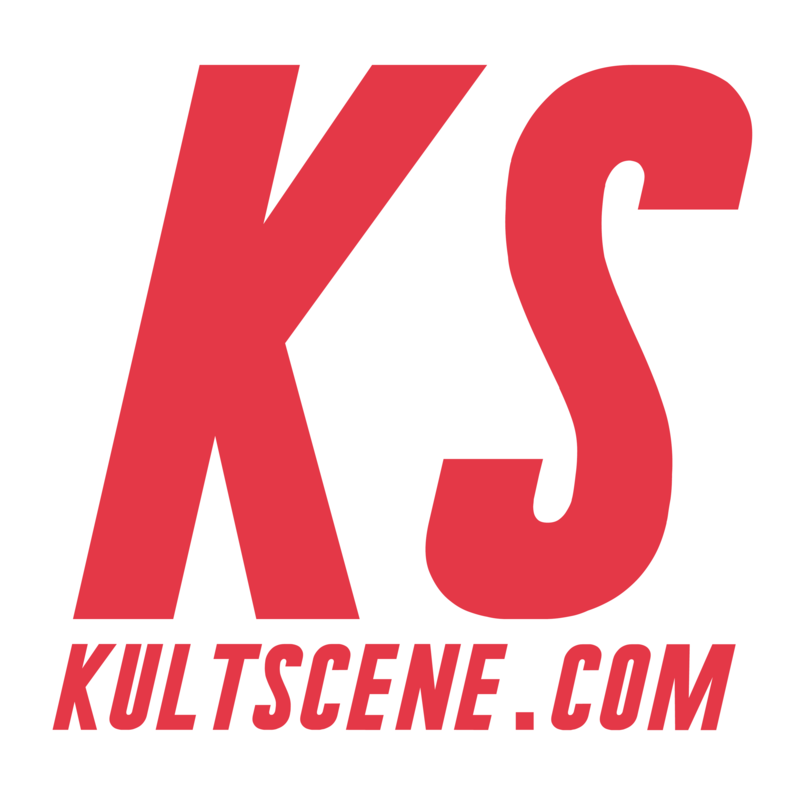 Don’t forget to subscribe to the site and follow us on Facebook, Twitter, Instagram, Tumblr, and Bloglovin’ so you can keep up with all our posts.